Lipton Orange Blossom Hibiscus Tea: Beautifully Delicious! 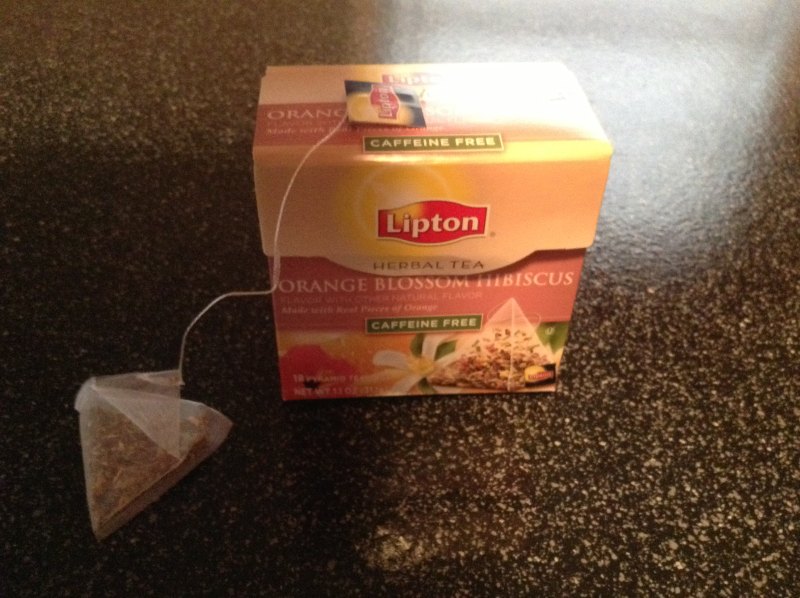 I had read some reviews for Lipton’s Orange Blossom Hibiscus a while back and was anxious to try it for myself. Even though most of the reviews said there wasn’t much flavor, I knew Lipton’s line of “Pyramid” teas well enough to know this couldn’t really be the case. Lipton and “not much flavor” don’t add up – so I went ahead with my pans to try it for myself. After one sip, I had to ask my cat (as she was the only one around at the time), “What flavor were these reviewers expecting? !” There is a wonderful flavor that, I would think, would be impossible to miss. It isn’t a flavor that will hit you in the face and spin your head around – like so many artificial flavors on the market. I honestly think it’s these cursed evils that cause people to sometimes quip, “… not much flavor..” Compared to the artificial flavors and sweeteners people have become so accustomed to, sometimes a lovely subtle flavor causes them to think there’s no flavor at all. Like all of Lipton’s Pyramid bag teas, the experience begins the minute you look at the bag. You can see the orange and the hibiscus (which has been proven to be wonderful for high blood pressure, by the way) alongside the tea leaves and you can most certainly smell them. When I first tried this beautiful tea, I used one bag for a cup of hot tea. It was fantastic. The next time, I used two bags and it was (of course) stronger and just as wonderful. For anyone who enjoys their tea’s flavors to appear “up front,” two bags is the way to go. I, however, prefer for the flavors to be subtly in the “background,” with the tea up front where it belongs. This tea is also great served over ice – especially with a slice of orange floating on top. It’s caffeine free, which means it’s ideal for a late evening cup of tea. It’s a beautiful way to bring your day to a close. You can buy Lipton Herbal Pyramid Tea Bags, Orange Blossom Hibiscus, 18 Count on Amazon at a GREAT deal. Click through for information. I 100 percent recommend all of Lipton’s “Pyramid Bag” Teas. By the way, do you know the reason for the pyramid shaped bags? Not only are they super cool looking, but the pyramid-shaped bags allow the herbs and fruit pieces to flow freely for full flavor and full aroma. I haven’t had one of these Lipton teas yet that didn’t reaffirm my Crazy Tea Chick status. See Lipton Herbal Pyramid Tea Bags for different varities or click through the slideshow below (certain mobile devices will not show the slideshow, so just use the link! ).